Fields of Blood: Free tournament points, part 2! Greetings my fat feathered friends! A bit of a smaller update for part 2. One of the easiest ways to make your army look a million times better (and thus, score significantly better for painting) - is to base them properly. It doesn't take too much effort to add bits of detail, a rock here, some bullet casings there, patches of static grass etc - but if we're talking maximum result for minimum effort, after all this is aimed at the end of the spectrum that doesn't like painting but doesn't like dropping tournament places for it, so in which case the best solution would be resin bases. 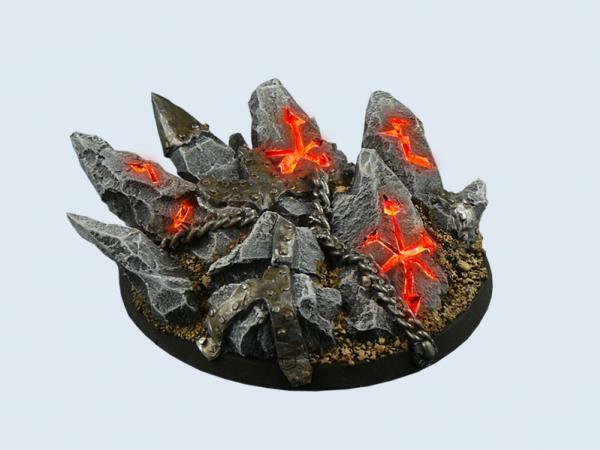 Resin bases are a very competetive market, which to you, means its quite cheap. 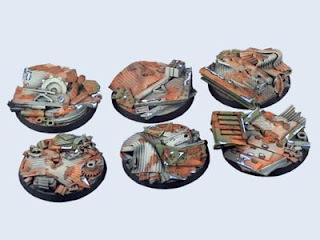 It will take you a single night to do an entire armys worth of bases, and another night to remove the old bases from your army, and put them onto the new bases. Which ever bases you decide to go for, aim for a rule of 3. 3 colours, or 3 areas of interest on it, keeps it from lookings too crowded, whilst stopping it from looking dull. A tried and true combo I like to use a lot is brown mud/dirt, grey rock, and green static grass, but you can go with anything. Little bits of detail ontop of this is fine, just try not to have it looking too busy, it will detract from the look of the figure and take you more time. The other tip that I can't stress enough, is to tidy up the edges! I prefer black - a lot of people either use graveyard earth or scorched brown, but when I see these I can't help but think they'd look even better black - it frames the base nicely, and just tidies everything up. I can guaran-damn-tee you that with decent basing, you will ALWAYS get more painting marks than you would otherwise deserve, for 1 night of drybrushing and 1 night of gluing. The only other lesson I'll pass on with resin bases, is that its never a good idea to look at your army and go "there's no way I'm going to pin these guys to the bases, theres 120 orks here, itll be fine, ill just be careful, they won't break!". They always break, and you're only fooling yourself. I'd hate to think how many times I've had to glue orks back to their bases because I was too lazy to pin them last time around! In terms of WHFB - unit fillers always look great and are a great way to take a units basing that much further. That being said, as soon as they look less like a unit filler, and more like you being cheap and trying to spread your figures around, we notice that, and it winds up making your unit look a LOT worse. Be tasteful with your unit fillers, so that it is adding to the unit, not taking away from it, and you can't go wrong. There is a great range out there for bases. I tend to use Back-2-Basix, Iron Halo, MAS and Dark Arts. I was going to do a little critique of a dozen or so different providers, but thought it warrented a separate post all on its own. Each have their own little strengths and nich areas. e.g. MAS are fantastic, but you need to be BALLING-RICH in order to buy them. Another thing to add is that for WHFB, simple resin bases can often look a lot better than the MAS-level detailed ones. You still want the unit to fit together and look coherent, and over the top bases can easily detract from that. 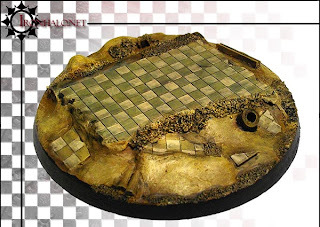 I would add to that, that in the spirit of the article (maximising painting marks for minimal time), you can get a lot of milage out of good movement trays. They really help with a units coherent look. Something of note that I really like the looks of is creating a height differential for characters or unit champions/command. You can have a really simple basing for most of a unit and then having that 1-3 figures that pop up above the horizon will look a lot more spectacular. Especially if you spend a little extra time on those figures while painting. I find it sometimes makes a passable paint jobs on rank and file models seem a lot better just because people don't notice the rank and file and just remember how cool that "unit" was.